SRP SAM — Key Systems, Inc.
Our sturdy Security Asset Manager™ cabinets can be configured with over 400 hooks. The secure ID login system monitors who is accessing the cabinet. Each user inputs his or her own PIN code to deposit or withdraw keys. Our Global Facilities Management System™ (GFMS) software allows for transaction logs and other reporting methods. The panels on this SAM have a dry erase finish. Each SRP SAM comes with a dry erase pen. 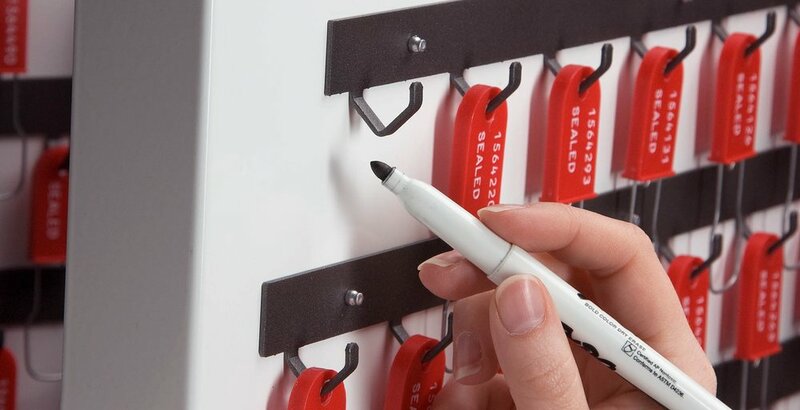 With hooks that accommodate virtually any style of key ring, users can store and retrieve keys quickly and easily. Each SRP SAM comes with replaceable key tags for key identification. 18" W x 18" H x 6" D, Approx. 22 lbs. 18" W x 27" H x 6" D, Approx. 30 lbs. 28" W x 27" H x 6" D, Approx. 42 lbs. 28" W x 36" H x 6" D, Approx. 55 lbs.